This conversation has been sponsored by Sweet Leaf Stevia, but as always, all opinions and text are 100% mine. 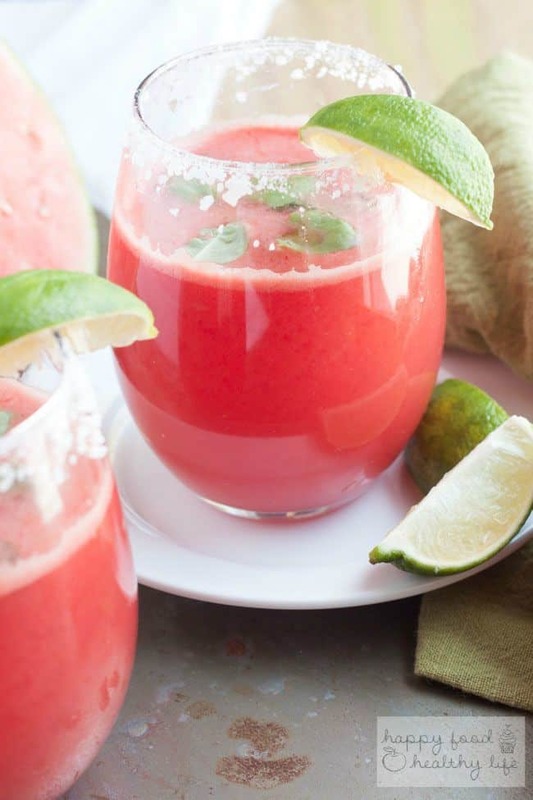 This Sugar-Free Watermelon Basil Margarita is a refreshing twist on your favorite cocktail, all without any added sugar – just all-natural sweetener. I have a vision. It is a vision that includes myself, my chair on the back patio, a book in one hand, and drink in the other. And of course it includes warm (not hot!) weather, silence (ie, no children), and possibly even a foot rub. Is that too much too ask? I’m thinking it might be. 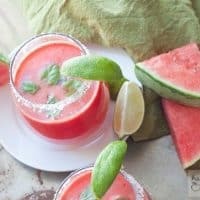 You may have noticed in a few of my latest drinks (especially my Peachy Lime Cocktail), I’ve been leaning toward using all-natural juices rather than filling the glass full of sugary syrupy nonsense. There’s no need for that. Cocktail calories add up so super fast, and I don’t know about you, but I’d much rather eat my calories in something like my perfect brownies or a s’mores dessert. So that’s where the natural fruit juices come into play. Watermelon was a ridiculously good choice this time around, and I don’t even like watermelon… seriously! On top of the fruit juices, I had to figure out a way to sweeten the drink without adding heaps and heaps of sugar. If you remember, last week I showed you just how easy it is to create a simple syrup using Sweet Leaf Stevia. 2 ingredients. 5 minutes. Done and Done. 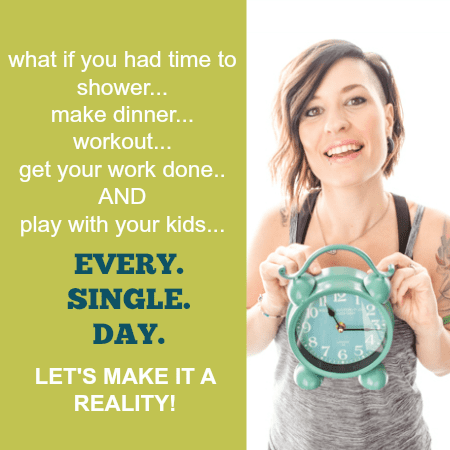 When I first heard about Sweet Leaf Stevia and started doing research on the company, I was totally impressed. From the very beginning of their company, they have always had the customer in mind. They work directly with the American Diabetes Association and American Dietetic Association and have committed to provide only the best-tasting product so it would be a seamless alternative to sugar for those who need to cut down on sugar, both out of necessity and desire. Another mission Sweet Leaf stands by is the drive to fight against childhood obesity by offering a healthy option. This is definitely a company I can stand beside! 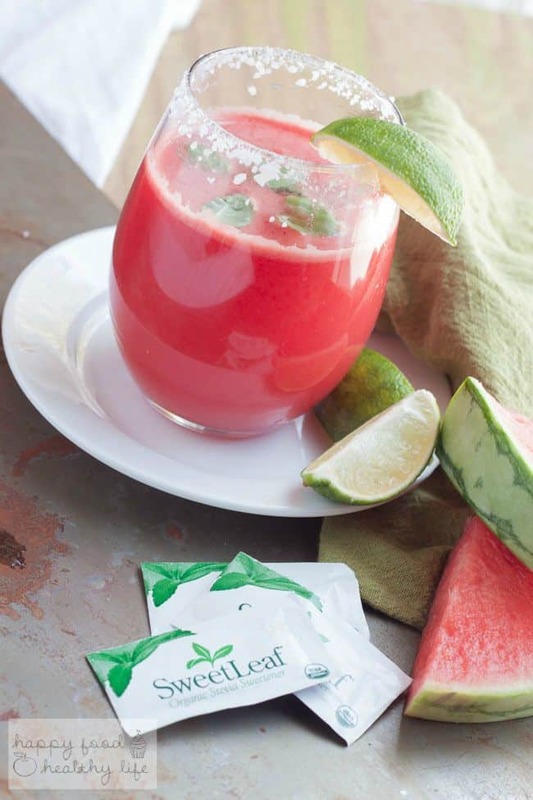 Ever thought you could have a flavored margarita that’s SUGAR-FREE?! 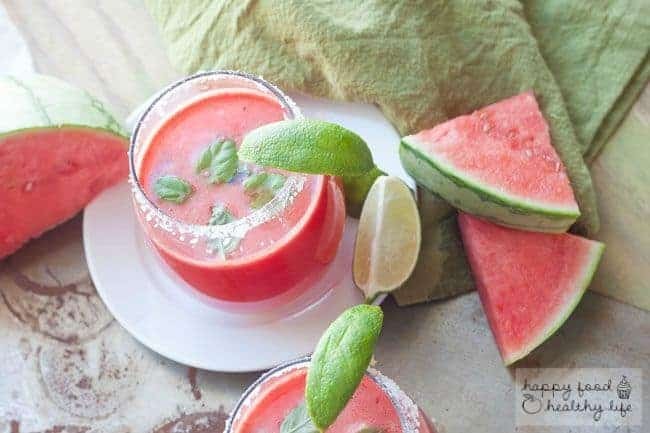 In a blender, blend half of a small seedless watermelon. Strain juice through in a fine mesh strainer into a pitcher so the pulp is left out. With water or some lime juice, wet the top of 2 low-ball or stemless wine glasses. Turn upside down onto a plate of salt and using your fingers press up against the glass so the salt sticks. Put half the basil leaves and lime juice in each of the glasses and muddle gently with a pestle or the back of a wooden spoon. 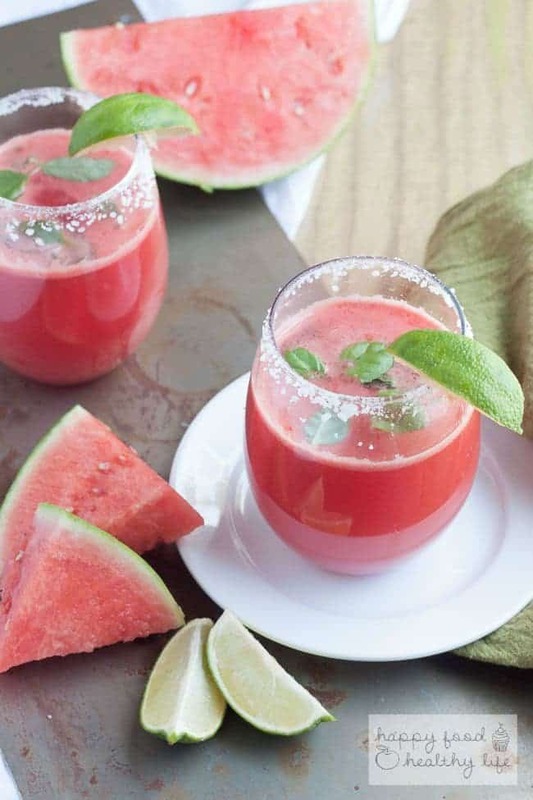 Fill glass with ice, 1-ounce each of tequila, 1.5 teaspoons each of Stevia Simple Syrup, and top with watermelon juice.